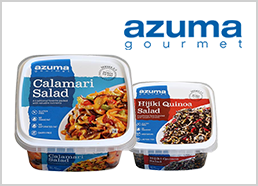 "Creating something new by combining East and West"
Azuma Foods International Inc. USA (AFI) strives to convey an "Assimilation of Food Culture to the World" by combining traditional Japanese cuisine with the world's many food traditions. Ready to eat and great with any vegetarian menu. Rich Lobster flavor, fully cooked, and ready to use. The award-winning item Calamari Salad, Seaweed Salad, and more!